More than 300 experts have gathered in Brussels on the 30 September-1 October 2013 to discuss the spread of nuclear and other dangerous weapons. 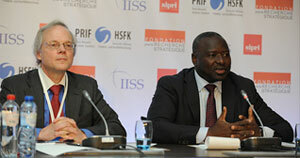 In accordance with the Consortium division of labour, IISS took on the main organizing role for the conference. Introductory Remarks were given by Maciej Popowski, Deputy Secretary General, European External Action Service (EEAS). Keynote address was given by Dr Lassina Zerbo, Executive Secretary, Preparatory Commission for the Comprehensive Nuclear-Test-Ban Treaty Organization. Evening Keynote Speech was given by Linas Linkevicius, Minister of Foreign Affairs, Lithuania. All the Plenary Sessions, introductory remarks and keynote addresses were recorded on video and are available through this website. The Conference online photo album is available on Flickr.